In case you haven’t already heard it from every fashion blogger and magazine, kick flares are the new denim you need in your wardrobe. This new shape looks to be inspired by the flared bell bottom jeans of the seventies, which is still a big trend in itself this season. The kick flare, however, is a much cooler take on this flared denim style due to its cropped length. Sitting anywhere between the ankle and the mid-calf, this new trend is much more flattering than you might think, and it’s extremely versatile. The pair I’m wearing here are from Asos, and they’re made of a stretch twill denim which makes them unbelievably comfortable. I’ve talked about my struggles finding jeans that fit right in a previous post, so I’m usually quite reluctant to even bother trying unless I’m really in love with them and desperate to try. That was definitely the case with these. I’ve wanted a great pair of kick flares for the past couple of months and one day decided to go ahead and order these, and I am so happy I did. I was quite shocked to find that they actually fit me very well, thanks in part to the stretch the denim has (although fair warning, hair and fluff sticks to them like mad, not good when you have a dog). Other than the fact that the length on these seemed perfect and the flare shape wasn’t too exaggerated, I loved that they have a raw edge hem. This is very popular for cropped denim this season, regardless of whether or not the leg is flared, and it is something I wanted my kick flares to have. It just adds to the modernity of them and keeps them looking cool and casual. I have seen so many people wearing this style of cropped flares, and each of them has worn them differently and all have looked good. There are so many ways you can style them. I personally like them kept casual with a top or t shirt. However, for a more tailored look, they look great with a crisp shirt or structured blazer. What drew me to this Asos pair in particular is that they have a figure flattering high waist, so they’re perfect to tuck your top into and add a belt for a stylish finish. There are endless styling possibilities. 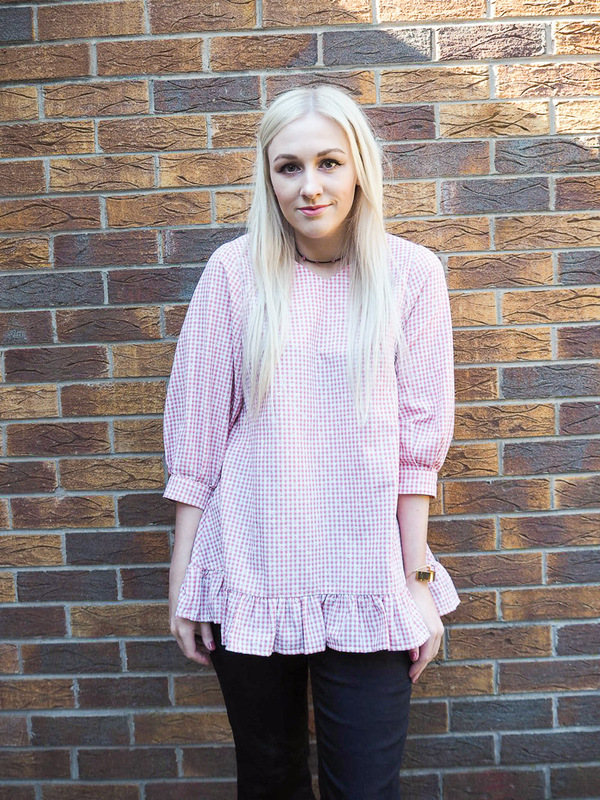 I decided to pair mine with an oversized pink and white gingham top I got recently from I Love Friday, a brand I’ve never bought from before but with whom I have now fallen in love with. 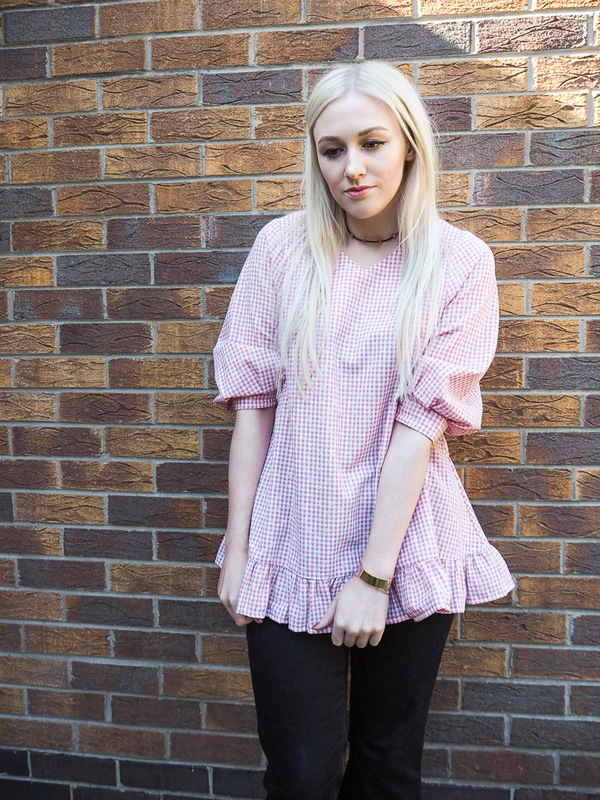 I have a real thing for gingham, not only because it makes me think of Dorothy’s adventures in the wonderful Land of Oz, but it also takes me back to when I was a little girl in primary school. 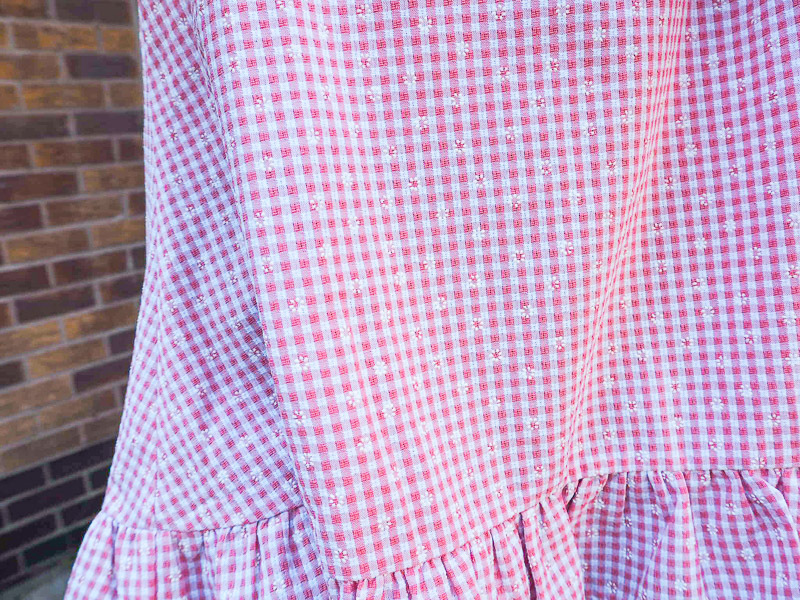 For anyone in the UK, do you remember the little gingham school dresses you were allowed to wear to school in the spring and summer instead of your typical boring uniform? They were the cutest little dresses. I absolutely loved them and I would always be desperate for the warmer months to roll around so I could wear them again. Anyway, ever since then, I have loved gingham and always seem to be drawn right to it for the spring summer season. This beautiful top is appliqued with the prettiest little white flowers and has a lovely ruffled hem, making it adorably girly and too cute for me to resist. 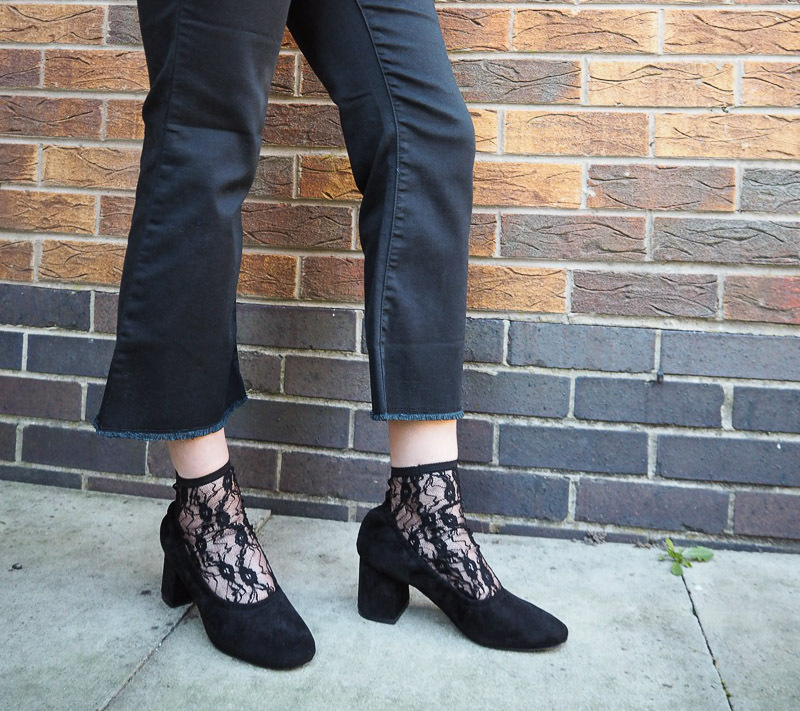 I completed my outfit by adding some little black lace socks and my gorgeous block heeled glove shoes which I shared with you in this post. The cropped length of kick flares makes for all kinds of greatness as it allows your shoes to be on full display. Just like with clothing, there are so many choices for your footwear with these jeans. You could opt for boots, trainers, sandals, flats, or heels; any shoes would work. I recently wore them with some heeled ankle boots and they looked amazing. 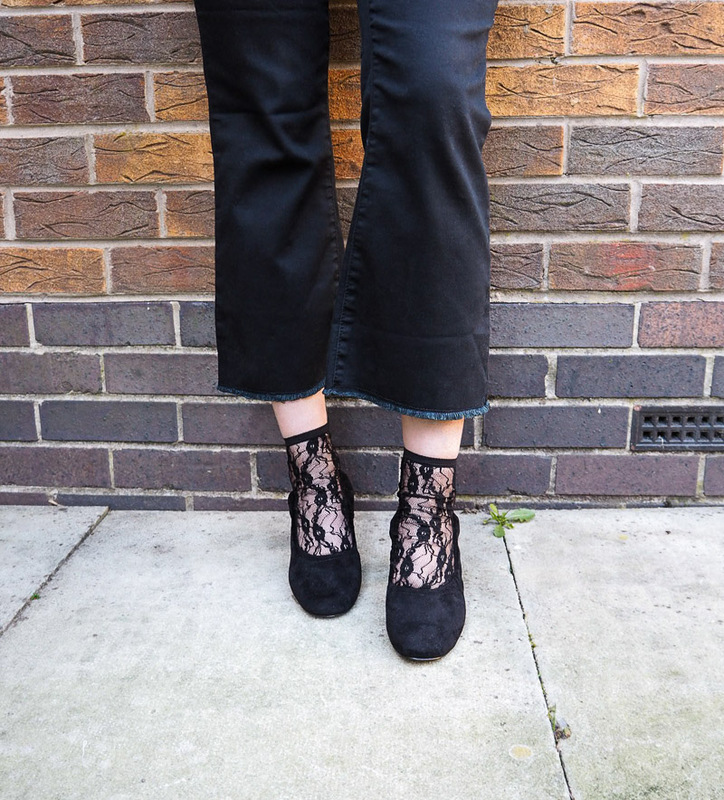 These kick flares are a great addition to my wardrobe and have given it an instant update. I absolutely love this look Katie. You look brill! I'm loving the flared jeans and like the sound of the raw hem as well. I want some now! Love them styled with the top too, suits you so much love a gingham print. Awesome look dear! Love your top! I bought some black kick flares back in December from River island and they're amazing but I've never worn them because they aren't high waisted, and I don't like low rise jeans haha. I defo need to invest in a high waisted pair fro summer though! This is a lovely look. Katie. I'm n love with your top. The colour is so pretty and you're right. Gingham print definitely reminds me of a summer school uniform dresses. Have a lovely weekend. This outfit is beautiful - I love everything about it. I want to invest in some kick flares but have never got round to doing it, I definitely will now!! Such a nice post. I really loved all the things in it, and the outfit is so nice! Amazing. I really love the way you rocked those shoes.! !